I had been watching a Bob Nudd video and at the same time, Mark had heard about Rookery Waters in the village of Pidley. So we decided to fish Magpie Lake at Rookery Waters. There are three lakes at Rookery Waters, Rook, Magpie and Jay. After speaking to the owner the night before we were told there was a small match on Magpie but we could still fish it, so pegs 9 & 10 were selected, again with an island to fish to. Again, I chose to use the pole as my main line of attack and Mark went for the two rod option, Carp Rod on buzzer and waggler approach. The going was very slow to start with very little coming on the short pole line. Infact it took about an hour to get the first fish, a little roach. Mark wasn't having much luck either... that was until his carp road went off! For Satuday, Mark and I decided to try Weston Lakes just outside Peakirk in Peterborough. We arrived at around first light, but had difficulty finding the lake. Turns out it is behind a large house on Thorney Road, just as your leaving the village of Peakirk, indicated by the red circle. What a great looking lake/large pond, would love to have this behind my house. We fished adjacent swims indicate on the map. My swim had an underwater hazard of a lilly bed which wasn't showing yet!!! Approach for the day for me was pole, Mark went for waggler and method feeder. It was a beautiful day and the big winter jackets came off, I even got a bit of sun burn to boot. I never took the camera out which was a mistake, sorry. Took the day off work and decided to head up to Cambridge from London for a weekend fishing with matey (Mark). On the way up I chose to visit Manor Farm Fisheries in Biggleswade and tackle the Blunham Lake, one that I've not tried before. Choice of attack for the session was the Pole and Feeder, here is the set up. The lake was pretty still, wind wasn't up and it kept on threatening to rain. The pole line was 10 metres out where the depth was around 6 feet. The pole line didn't produce anything other than roach. While fishing I noticed that there was bigger fish crashing out towards the middle of the lake. I was the only person fishing the lake all day, so after spotting this activity I took out the feeder rod, 6lb mainline with 4lb hooklength of about 18" to a size 14 and put a nice juicey worm on the hook. 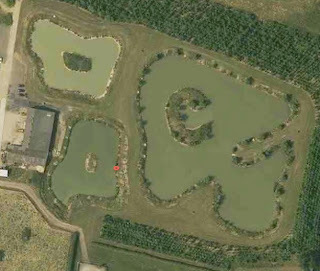 Although Manor Farm in Biggleswade could be classed as a commercial fishery, the lakes we fished were a lot bigger and more natural in appearance. 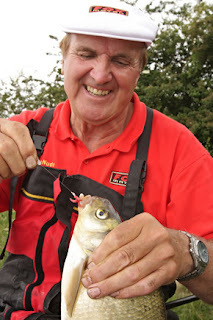 A fishery that my mate Mark had heard a lot about was Lawn Farm Fisheries near Cambourne, Cambridge, which is more like your typical commercial fishery. Mark and I flip a coin for swim choice, I win and pick the swim indicated on the map. We fished Cherry Tree lake, the smaller lake on the right handside. Mark picks the swim to my right, we do like our sociable fishing and mickey taking, so here are our two respective swims in a bit more detail.. I decide to again use the pole as I can reach the island and the ledge. In fact since buying the pole I hardly ever get the waggler rod out, which I must sort out as I do miss launching a float with a rod and reel. Baits for the day, hemp as feed, micro pellet, white and red maggots, corn and new to me, banded pellets. So I couldn't refuse. We picked a weekend and decided to tackle one of the many drains in the Fens around Cambridgshire. Chosen methods were dead baiting and spinning. Having never caught a Pike I was a little apprehensive about landind one, but we went armed with a glove and long forceps just incase... when you see the pictures of the Pike, you'll wonder why I was nervous!!! We needed dead bait, so off to Peterborough market and a small Spanish fish stall... half a dozen sprats later and 70p lighter we set off for Ramsey Drain. Plan of attack was to spin and cover as much as of the drain as possible. Mark scored first with this little jack pike. You can see that the weather wasn't the best, but hey, we were out fishing, thats what counts! 40th Birthday... What a great present!!!! So, I turned 40 early in February and of course my parents had a tough time buying me a present. So, a letter arrives for me from none other than Mr Bob Nudd, MBE!!! I've got a days masterclass with Bob. I was over the moon, what a great present. After missing Bob's call, I emailed him and we decided to fish Decoy Lakes, Peterborough in July. I cannot wait, plus I'll get to appear on Bob's blog. I joined Uxbridge Rovers Angling and Conservation Society as they have some good local stillwaters and rivers. The Christmas period and the poor weather meant that some of the lakes I wanted to try were quite simply unfishable as there was a thick covering of ice, so at the first sign of a break in the weather I decided to try URACS Billet Lane. Billet Lane is a 1.5 acre working irrigation reservoir and as such the water level can vary dependant on what the farmer has taken out. I set out to fish Billet Lane on the weekend of 22nd and 23rd of January with two separate approaches each day, both on the same peg, unlucky number 13. Saturday I opted to fish the pole. 16 years since I last fished the pole, this would be interesting!